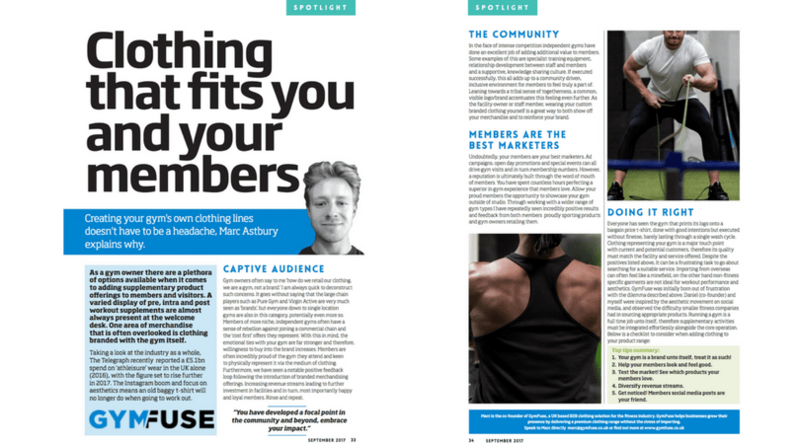 The above article was featured in September 2017’s copy of Gym Owner Monthly. I have inserted the full articles text below for easy reading. The piece is fairly long, but holds some key points to consider for owners of gym’s, fitness centres or bootcamps. After numerous conversations with our customers, the need for gyms to add more value and diversify income streams has become increasingly apparent. Selling clothing at the gym forms just one element and/ or option that owners have to consider when adding to the core offering. As a gym owner there are a plethora of options available when it comes to adding supplementary product offerings to members and visitors. A varied display of pre, intra and post workout supplements are almost always present at the welcome desk. One area of merchandise that is often overlooked is own branded clothing. Taking a look at the industry as a whole, The Telegraph recently reported a £5.1bn spend on ‘athleisure’ wear in the UK alone (2016), with the figure set to rise further in 2017. The Instagram boom and focus on aesthetics means an old baggy t-shirt will no longer do when going to workout. Gym owners often say to me ‘how do we retail our clothing, we are a gym, not a brand.’ I am always quick to deconstruct such concerns. It goes without saying that the large chain players such as Pure Gym and Virgin Active are very much seen as ‘brands’, but everyone down to single location gym’s are also in this category, potentially even more so. Members of more niche, independent gyms often have a sense of rebellion against joining a commercial chain and ‘cost first’ offers they represent. With this in mind, the emotional ties with your gym are far stronger and therefore, willingness to buy into the brand increases. Members are often incredibly proud of the gym they attend and keen to physically represent it via the medium of clothing. Furthermore, we have seen a notable positive feedback loop following the introduction of branded merchandising offerings. Increasing revenue streams leading to further investment in facilities and in turn, most importantly happy and loyal members. Rinse and repeat. In the face of intense competition independent gyms have done an excellent job of adding additional value to members. Some examples of this are specialist training equipment, relationship development between staff and members and a supportive, knowledge sharing culture. If executed successfully, this all adds up to a community driven, inclusive environment for members to feel truly a part of. Leaning towards a tribal sense of togetherness, a common, visible logo/brand accentuates this feeling even further. As the facility owner or staff member, wearing your custom branded clothing yourself is a great way to both show off your merchandise and to reinforce your brand. Undoubtedly, your members are your best marketers. Ad campaigns, open day promotions and special events can all drive gym visits and in turn membership numbers. However, a reputation is ultimately built through the word of mouth of members. You have spent countless hours perfecting a superior in gym experience that members love. Allow your proud members the opportunity to showcase your gym outside of studio. Through working with a wider range of gym types I have repeatedly seen incredibly positive results and feedback from both members proudly sporting products and gym owners retailing them. Everyone has seen the gym that prints its logo onto a bargain price t-shirt, done with good intentions but executed without finesse barely lasting through a single wash. Clothing representing your gym is a major touch point with current and potential customers, therefore its quality must match the facility and service offered. Despite the positives listed above, It can be a frustrating task to go about searching for a suitable service. Importing from overseas can often feel like a minefield, on the other hand non-fitness specific garments are not ideal for workout performance and aesthetics. GymFuse was initially born out of frustration with the dilemma described above. Daniel (co-founder) and myself were inspired by the aesthetic movement on social media, now household brands such as GymShark were visibly evolving into industry powerhouses. This was excellent for the end consumer, but the issue of sourcing a supplier and creating a clothing line for businesses still lingered. Your gym is a brand unto itself, treat it as such! Help your members look and feel good. Test the market! Start small see which products your members love. Get noticed! Members social media posts are your friend. This entry was posted in Fitness Branding, General. Bookmark the permalink.